Moving into the 21st century, libraries, more than ever, have taken on a larger role within schools and communities. No longer restricted as a repository of books, today’s libraries function as a place to access knowledge and information as well as offer space for community meetings and cultural presentations. 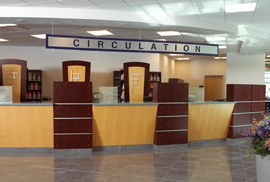 Nu-Tech Furnishings assists in helping libraries to be multifunctional with creative, innovative designs and products. We can make your library a welcoming and inspiring environment for individual learning and enlightenment as well as community enrichment.